Accommodation was excellent, even the sofa bed. Marco and his uncle were so helpful in getting us entrance into Plitvice and told us where to go to maximize our short stay. Marco got us entry tickets to Plitvice the night before and gave us a map of the park. Can't say enough good things. Villa Sumrak was a wonderful find! Great location away from the crowds of the Plivite Lake area. Hosts are incredibly welcoming, knowledgeable and helpful. Rooms are traditionally decorated, with comfortable beds, incredibly clean throughout. nice family boutique / bnb. super cozy. very nice feel. good check in, helping me with the park and where to go and hike and all the secret spots. helped with tickets for us. helped carry in our extremely heavy bags. would recommend! Miro and his family were amazing! So friendly and incredibly helpful with every suggestion & with planning our adventure. The dinner was delicious!!!! We would definitely recommend their place to anyone wanting to visit the Plitvice Park. The host, Miro was great and the location just 20 minutes from the big waterfall! We had the upstairs 2-bedroom apartment, which was large, nicely decorated, and very clean. The dinner (added charge), was superb and worth every penny! Miro and Marina are excellent cooks, and we enjoyed every bite of the 3-course meal with generous portions. The location is very close to the highest waterfall in the Plitvice Lakes National Park, and the property is well-maintained. Miro, Marko and Marina are friendly, personable, helpful, and fun. Miro is quite willing to share his knowledge of the park and the best ways to see it. Not counting the construction going on next door during the daytime while we were there (temporary in nature, and almost finished), the surroundings are tranquil and relaxing. I would HIGHLY recommend this property. I look forward to returning someday and spending more time there. The hosts were extraordinarily kind and welcoming. There wasn't anything particularly quaint or unique about this place, but we felt so at home and welcomed, and very comfortable. I loved the location of the property and the staff working there. I felt like I was in a family members cabin home. Just minutes walking to the main national park and the location allows you to beat the crowds during high season. The best was all the advice and attention to detail by the staff. For example, they created special maps so that you are able to get the full experience of the park and be able to hike back home. We also had dinner and breakfast there which was an excellent decision. The fresh home cooked meal featured local cheeses and meat, with an explanation of how to eat them and get the most out of it. We had local delicious white wine and the main course was freshly cooked in the BBQ. To top it off we had a great dessert. Breakfast was also really fresh and homemade and included lots of fresh fruit. I would definitely recommend this location and recommend it for couples and families. You can't find any better deals than this one. It's location is perfect, the owner is smart and kind, and the entire family is gifted with best cooks. We had the best BBQ we've ever had! Highly recommended! Lock in a great price for Villa Sumrak – rated 9.3 by recent guests! Villa Sumrak This rating is a reflection of how the property compares to the industry standard when it comes to price, facilities and services available. It's based on a self-evaluation by the property. Use this rating to help choose your stay! Villa Sumrak is located within Plitvice Lakes National Park, only 650 feet from the the Plitvica River. It offers apartments with an LCD satellite TV and a patio or a balcony. A garden with barbecue facilities is at guests’ disposal. Guests can relax by playing table tennis or darts and there are some guitars which can be freely used. With all the lakes within walking distance the surrounding nature offers many opportunities for hiking. The Big Waterfall is only a 15-minute walk away. From there a path leads to Kozjak Lake. Sumrak can also organize hiking tours around Plitvice Lakes, horse riding, fishing on the River Gacka, or kayaking and rafting on the rivers of Korana and Mrežnica. 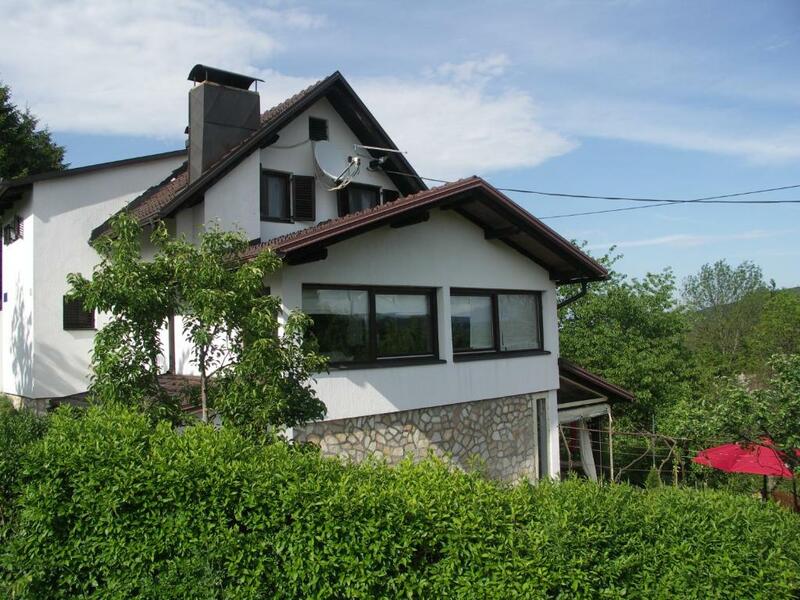 This property is also rated for the best value in Plitvica Selo! Guests are getting more for their money when compared to other properties in this city. When would you like to stay at Villa Sumrak? Villa Sumrak is located in Plitvice village, which is one of the very few villages situated in the immediate vicinity of the lakes- only about 10 minutes walking distance to the Great waterfall, and about 15 minutes to the central lake. The hosts have given their best to ensure a welcoming and beautiful ambient both inside and outside the villa. The food served is organic, authentic and delicious local food. After a longer period of working for multinational companies we have decided to start this line of work instead. Although ourselves born and raised in Zagreb, the country's capital, some of our ancestors come from the very Plitvice village. Thus we are quite familliar with the traditions, history, customs and secrets of the region. All of us have university education and a variety of different interests and hobbies, from philosophy and music to fitness. We also speak german and english. Besides enjoying the beauty of the park, one may try one of the several hiking trails on the hills surrounding the lakes, as well as rafting or fishing on the surrounding rivers. One may visit Barać and other caves, bear orphanage, or explore the ''Villa Izvor''- an abbandoned villa that used to belong to the marshal Tito. Finally, one may use a vehicle to drive less than 2 hours to one or more of the following destinations that are well worth visiting: Zadar, a lovely adriatic seaside city, and national parks Paklenica, Krka and Kornati islands. House Rules Villa Sumrak takes special requests – add in the next step! Villa Sumrak accepts these cards and reserves the right to temporarily hold an amount prior to arrival. To get to the property, if coming from the North (e.g. Zagreb), exit the highway in Karlovac, then continue in the direction of Slunj and Grabovac for 1.2 mi. Before the bridge on the River Korana, turn right onto road 42 in the direction of Plaški and continue for 2.5 mi. At the junction in the Poljanak village take the road to Plitvica village. Then follow the Villa Sumrak signposts. If coming from the South (e.g. Zadar or Split through Korenica), go through the main entrance of the Plitvice Lakes National Park and continue for 3.7 mi. Turn left 1,650 feet after passing the blue bridge over Korana River and go uphill to road 42 in the direction of Plaški. Continue for 2.5 mi and turn to the Plitvica village at the junction at Poljanak village. Then follow the Villa Sumrak signposts. If coming from the West (e.g. Rijeka or Istria), take the highway to Zagreb until you reach Bosiljevo, then turn to the direction of Split. Exit at Ogulin and take the direction to Plaški. Continue for 2.5 mi and turn to the Plitvica village at the junction at Poljanak village. Then follow the Villa Sumrak signposts. Please inform Villa Sumrak of your expected arrival time in advance. You can use the Special Requests box when booking, or contact the property directly using the contact details in your confirmation. We loved everything - the location was so great, right in the middle of nature and beautiful - walking distance to the boat to the Plitvice National Park. There was a kitchen but we did not cook and they made excellent dinner and breakfast at the villa. The total walk in the park was 20 kms - our kids 7 and 13 did not complain at all. The park is very beautiful, in the midst of untouched nature. Great job Croatia for preserving nature so well. The family thats owns the villa are excellent - we got great tips and they were super friendly. Thank you Marco for everything ! The hosts were very hospitable. They wait our arrival till the night and fed us. At the morning Miro provided us the tickets, map and explanations about the Lakes. So, we had to waste time for searching the correct ways to enjoy the beautiful neater. The food that they made was really great. The floorboards in some parts of our apartment creaked and may have been an issue for the apartment below. We tried to be as quiet as we could when walking - dont know how successfully. The second floor two bedroom apartment we booked was very comfortable and spacious. It even had a lounge room seperate from the kitchen and dining area. The rooms had all the appliances and utensils required to cater for ourselves An extensive choice if tea bags were provided as well as salt and pepper. The hosts were at the property when we arrived and offered us a drink while they took our passport details and described the villa's facilities and park access. They organised park entry tickets and a map for us for the next day and explained the best route around the park to take advantage of starting on the opposite side of the lake to the main entrance. The location is superb for easy walking access to Plitvica National Park and avoiding crowds. The hosts will provide breakfasts and dinner if required and you can choose to eat in your apartment or interact with other guests downstairs. Meal prices are comparable to restaurants in Croatian tourist towns. Our apartment did not have a washing machine and we didn't check if one was available to use in the building. I think this is a lovely place to stay 99% of the time. The regular hosts are a mom and dad - they were on vacation when we travelled there. Their sons were in charge during their absence. They were incredibly sweet during our stay but had friends over (as this was their home) and stayed up talking and laughing until very late in the night, most of the guests were trying to sleep but it was pretty loud. We had to go down and ask THEM to be quiet. Also the breakfast in the morning was 12 euro per person and consisted of instant coffee, bread and eggs. Either that should be included in the price of the stay or they should consider a more appealing breakfast menu. They also wouldn't serve breakfast before 8am, so we had to wait to visit the park - which gets busy very early in the morning. The hosts were very welcoming and helpful for visiting Plitvice lakes. They provided a wonderful dinner and explained the best way to visit the lakes in the morning. The location is close to the bigger falls. We had excellent service although the place was busy with a few people arriving at a similar time, Excellent help in working out the best way to walk the lakes and best advantage points for views etc. Very nice and lovely family business, friendly and helpful hosts. We have ordered a delicious dinner which was made by the hosts. We liked the stay very much. The location, the dinner and breakfast we had was fantastic. The owner and his family absolutely lovely and accommodating hosts. A very warm welcome and goodbye. The scenery was amazing and the lakes incredible. Would go there again to stay. It's not so much as not liking, but just as FYI for fellow travelers with a not so strong currency- the accommodation is very very reasonably priced, and we were excited to have a dinner at the property, but at EU29 per person (R500 for us South Africans) it was really steep for a fairly average meal. Perhaps just informing clients of these prices prior to arrival would allow people to make more informed decisions re food. Absolutely not a complaint and we are here for the experience and the hosts were incredibly welcoming and friendly. They do have higher food costs for being in the park so there's reason for the cost, but would just have been nice to know before hand. There are super markets and restaurants before you head up to the park so are options. Obviously the location is fantastic being right in the park. The host gave us a great tip on doing Plitvice as we arrived a bit later than is conventional but his suggested worked in our favour. Comfy rooms and very easy going family atmosphere. super early check out was a bummer.. had to arrive by 10pm because they were going to sleep. small complaints though. This property is full of charm and has a ski chalet feel about it. The room was spacious, lovely and quirky. The hosts were helpful and very nice. We got the best advice as how to get the most out of our visit to the park. We would have loved to stay longer! Super Accueil familial et hotes aux petits soins :-) Dinner and Breakfast with high quality ! Excellent experience - we highly recommend it.